Available in blue or black. Two smaller capacity packs are also available. This unusual medium-size daypack from MindShift Gear has a split personality. 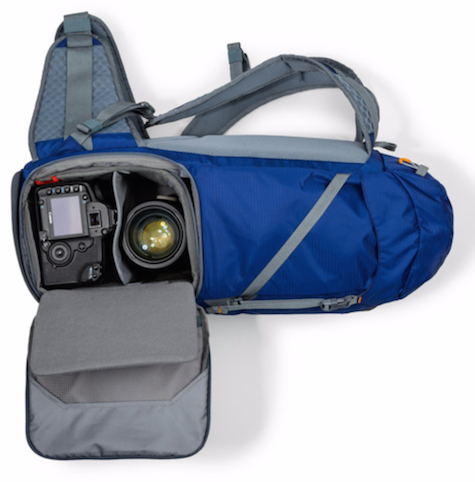 The included removable dedicated camera and lens with strap insert is large enough to carry a jumbo six-pack of your favorite beverage plus cold block and a few sandwiches when it’s not being used to hold your photo gear. 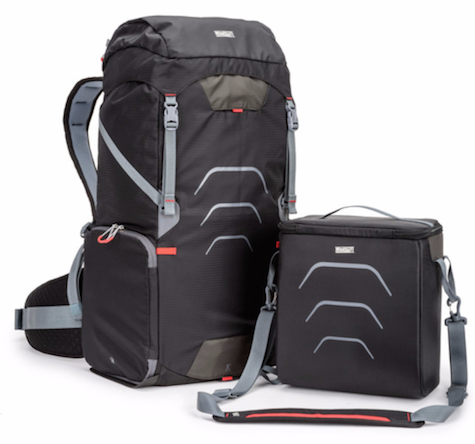 You can use it separately or stow in in the bottom half of the UltraLight Dual 36L, with access to the insert from a side zipper. A folding trap door panel divides the interior of the main pack into two compartments, whether or not the camera/drink insert is in place. Construction is solid on this pack, using durable and super-lightweight materials. The rear straps and back support are comfortably padded, as is the waist support belt. This belt has a small zippered compartment for personal items, and the pack has a single large water bottle side pocket. The interior has an adequate zippered mesh pocket at the top front and a large drop-in pocket at the rear for a laptop computer or water reservoir. 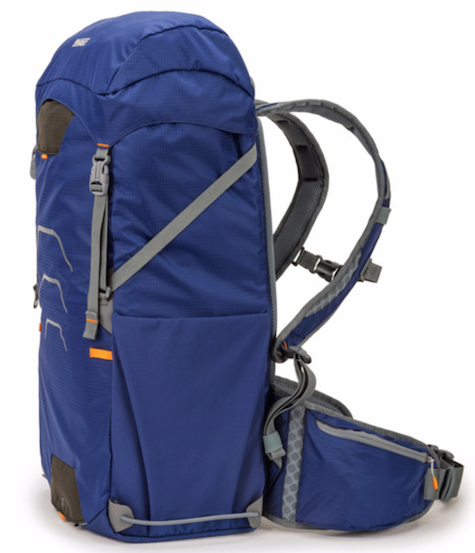 The pack closes at the top with a draw string and snap-shut weatherproof flap. This flap contains another handy zippered pocket. A separate rain cover is included. 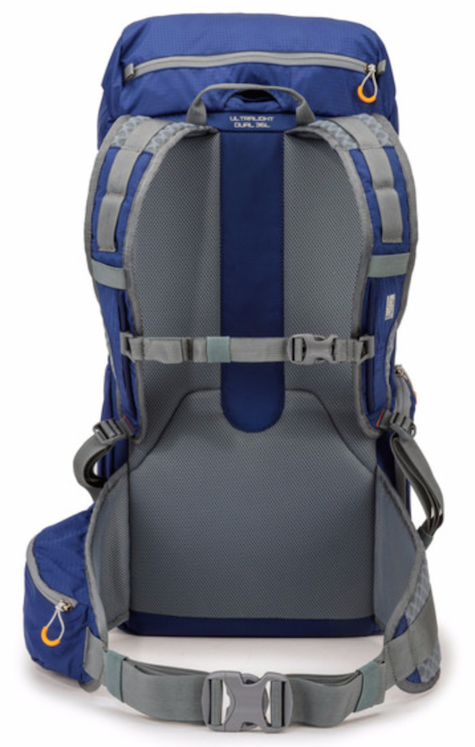 When UltraLight Dual 36L is fully loaded it can be heavy due to its large capacity, in spite of the pack’s lack of bulk. I am not a fan of the side-pocket removable insert for photographic use. I prefer loading the pack with as many personal, non-photographic items as I can carry comfortably, and tote the jumbo gear/six-pack rugged insert separately. It too has an upper flap above the camera compartment dividers plus a small zippered mesh pocket built into the lid. There are several reviews with action photos such as the ones linked below to help you decide if this combo pack is worth considering. The $200 price tag is reasonable for high quality construction materials without cutting any corners to produce the lightest weight multipurpose product. As a daypack or weekender, the main pack is excellent. You can choose what to place in the bottom half with quick access from the side zipper. I continue to find unexpected uses for the zippered insert with shoulder strap that have nothing to do with photography. The overall versatility of UltraLight Dual 36L Multipurpose Camera Backpack helps me recommend it, but not necessarily for its original purpose.